Why? Because God is love, and the world is a war zone. The chief combatants are God and Satan, and what they are fighting over is you. Yes, people are the prize, the spoils of war, if you will. God wants to win people so He can love them, bless them, and give them everlasting life. The Devil wants to win people so he can destroy them (John 10:10a). Because both God and Satan are spirit beings, this ongoing battle is being fought primarily in the spiritual realm, with its manifestations made evident in the physical realm in which we live, that is, the world. Both Commanders-in-Chief, God and Satan, have spirit-being “troops” that they command in the battle. God has those whom the Bible calls “angels” (in both Hebrew and Greek the word for angels means “messengers.” This includes what we call guardian angels, warrior angels…), and Satan has those referred to as “evil spirits” or “unclean spirits.” Spirit beings are beings with a life force and a composition that are different than those of a human being. A study of Scripture shows that all of these spirit beings were originally good “angels.” Beside Michael and Gabriel, the other highest-ranking angel was one whom Scripture refers to as the “angel of light” (and by many other names and descriptions). Angels were given free will, and it was “Lucifer” who rebelled against God and somehow persuaded one-third of the other angels to choose to join him in his attempt to usurp the throne of heaven (see Isa. 14:12ff; Ezek. 28:14ff; Rev. 12:3 and 4). They failed, were condemned to eventual extermination, and ejected from God’s presence. They now inhabit our world, where they are doing as much damage as they can to mankind before their time runs out and they are destroyed. As is the case with many important biblical truths, Satan has introduced much error about angels—what they are and what they do. For example, It’s a Wonderful Life is a great movie, but “Clarence” is a lousy theologian—angels are not dead people. Neither are they chubby babies with bows and arrows. Angels are spirit beings that God created before He created mankind. Because there are both good spirit beings and bad spirit beings, we must know what God’s Word says in order to discern between the genuine and the counterfeit. The good news is that three-thirds minus one-third equals two-thirds. We have millions of supernatural enemies, unwaveringly bent on our destruction, but we have twice as many supernatural friends, whose only mission is to help us in any way they can! Actually, we have more than twice as many on our side, because some of the original one-third are now “in chains” due to their behavior in the time of Noah (Jude 6). If you are a Christian, you know that you are never alone, because your heavenly Father and your Lord Jesus are always flanking you on the path of life, but you can know that there are also angels with you wherever you are. As spirit beings, they don’t take up much space, so there could be 26 of them in your car with you, or at least sitting on top of it. The best news is that there is one man who successfully faced and defeated Satan and his evil-spirit minions on their own turf. Because he did, Jesus Christ was highly exalted to the right hand of God, and he is now the Commander-in-Chief of God’s armies. He has earned the right to intervene in both the spiritual and earthly realms on behalf of those who call upon him in faith. One of the ways he does so is by sending angels to do battle with the evil spirits afflicting people. As we will see, Scripture gives us ample information about the role of angels in helping people, primarily by providing protection, direction, and provision. There are about 275 references to angels in Scripture, and about 50 of those show angels helping people, almost always those who are believers. Apparently that leaves them little time to sit on clouds and play harps. Though present in works of art, that is absent in Scripture. It is important to note that there is no verse in the Bible saying that human beings can command (or ask) angels to do anything, as some Christians today teach. No, that is the Lord’s job—they are his messengers and servants, not ours. Neither does the Word say that people are to worship angels. In fact, Scripture shows that angels respect believers, who they are here to help (Dan. 10:11). It appears that angels recognize that people were originally made in the image of God, and that people are the focus of God’s infinite love. The phrase, “…those who will inherit salvation,” is misconstrued by some who teach that it refers only to unsaved people, who angels guard and keep alive until they get saved. Then, they erroneously teach, when one gets born again, his “guardian angels” leave him. They teach that angels do not help believers. Not only is that idea clearly contradicted by God’s Word (chances are that David, Daniel, Peter, Paul, et al., and Jesus were in that category), it makes no sense. Think about it: finally, after however many years of living in sin and maybe being a great asset to the Devil, a guy gets born again and becomes an asset to God, and God then withdraws His angelic protection?? Plus, it wouldn’t exactly be fair to angels to have to hang around only jerks and criminals. I mean, what did they ever do to deserve that? Biblically, salvation for a Christian has a past, present, and future aspect to it, as per Scripture written to the Church. Romans 10:9; 2 Corinthians 1:21 and 22; Ephesians 1:11–14; Titus 3:5 and 6; 1 Peter 1:3–5, et al., talk about the past aspect: we have been born again of incorruptible seed and are guaranteed everlasting life. Philippians 2:12 and 13, 3:20; Titus 3:7; 1 Peter 1:6–8, et al., refer to the present aspect: we grow in our faith by standing firm amidst trials, “working out” our salvation. Philippians 3:21 and 1 Peter 1:9, et al., speak of the future aspect: the consummation of our salvation when we receive our new bodies. It is of that future aspect of inheriting our salvation that Hebrews 1:14 speaks, indicating that angels help believers until their salvation is perfected at the appearing of Christ. There are many, many examples in Scripture, a few of which we will talk about. Some we won’t cover are found in Acts 5, 8, 10, 12, and 27, they are very stimulating and encouraging. I love the record in Acts 12 of the angel waking up Peter in prison by tapping him on the side! Hold it—angels are spirit beings—how come the angel’s hand didn’t pass right through Peter? Because, as the Bible makes clear, angels know how to do what I call “the molecule trick.” That is, they know how to arrange or re-arrange molecules into different forms, and thus can come into concretion in the form of people. When they do, they look like people, sound like people, and feel like people. They even eat (and it is obvious what to fix for them if any show up at your house). Not only is it the biblical testimony that angels assist believers, but if you have spent much time around Christians, you have heard many accounts of “people” (actually Traffic Division angels) showing up out of nowhere to help them when they were stranded motorists—and then disappearing; others (Child Care Division) leading their lost children home—and then vanishing; others showing up as big, muscular men (Security Division) to scare off their attackers, either military or civilian. Let us be clear, however, that in His Word, God makes it plain that He does not have carte blanche in regard to intervening in people’s lives to help them. If He did, He would, because God is love. Thus, by the definition of love, and by the testimony of His Word, we know that He is always doing everything He can to protect us, rescue us, heal us. Think about it—that means that when He does not do so, it is because He cannot do so [For further study on this subject, see our book Don’t Blame God! and our audio teaching You Are the Only You God Has]. For example, God wants to save all men, but He cannot. Why? Because many do not cooperate with Him by making a free will choice to believe in Jesus Christ. So it is in our daily lives as Christians: to a large degree, God needs our cooperation, that is, our faith. The more we trust and obey His Word, the more He can do for us, often by way of angelic intervention. For example, after Satan’s final temptations of Jesus in the wilderness, “…angels came and ministered to him” (Matt. 4:11). And Jesus might not even have been there had not angels appeared to both Joseph and Mary prior to his birth and told them of God’s miraculous plan for them. You can find many more biblical accounts of angels interacting with people, but in closing, let us consider in some detail two very informative and inspiring biblical records regarding such intervention. I encourage you to read these accounts for yourself. They are most vivid, so picture them as I summarize them. 2 Kings 6:8–23 is a very comforting and encouraging record of angelic protection. This time it was Elisha who was the target, and the king of Aram and his army who were the human vehicles for Satan’s evil spirit-inspired attack. When the king found out where Elisha was, he sent a huge force to get him. The next morning, when Elisha’s servant went out to get the paper, he found an army with horses and chariots encompassing the city. The servant freaked out, and Elisha’s reply to him is worth quoting: “Don’t be afraid…Those who are with us are more than those who are with them.” The kid looked around, saw no one, and said, “Huh?” So Elijah prayed that he would be allowed to see into the spirit realm. God answered his prayer, and the young man saw “…the hills full of horses and chariots of fire all around Elisha.” There was more than enough angelic protection for Elisha and his servant. When the army came toward Elisha, he prayed to God to strike them with blindness, which He did. Elisha then went to the leader of the army, who couldn’t see who he was, and told him that he would take them to find the man they were looking for, and he led them right to the king of Israel and his army, which is who they saw when their eyes were opened. The king wanted to kill them all, but God graciously had Elisha tell him to instead prepare a great feast for them, after which they returned home peacefully. And finally, Daniel 10 gives us more information about the unseen spiritual battle raging around us. Daniel received a remarkable vision from God that greatly concerned him, so he began to pray for greater understanding of it. Three weeks later a “man” showed up who was obviously not your next-door neighbor. In many biblical accounts, the angels who show up look like other humans, but this guy was spectacular in his appearance, and his voice had a lot of “reverb” going on (vv. 5 and 6). The angel proceeded to tell Daniel that his prayers had been heard 21 days earlier, but that the reason it took him so long to get there was because he had to fight his way past “…the prince of the Persian kingdom…,” and he couldn’t do so until Michael came to help him fight. Would that be a human prince? Hardly. That mighty angel would have taken about two seconds to dispatch any human. No, that “prince” was a high-ranking, territorial demon, and a formidable foe. In the presence of the angel, Daniel was astonished almost to the point of passing out, so “…the one who looked like a man…” (v. 18) touched him and gave him strength. Then he explained the vision to him. Here we see angelic direction and provision. What we can learn from that record is that because of the intense battle constantly raging around us in the spirit realm, God cannot always answer our prayers immediately or provide what we need right away. But we know that He is always doing His best for us, so we faithfully hold on to His promises, never forsaking what we do understand in the face of what we do not yet understand. I hope you will do your own study of angels in the Bible, and I trust you will find it rewarding and encouraging. In light of the truth that the primary God-given responsibility of angels is to minister to believers, my often-imaginative mind envisions the following scenario. Like chauffeurs outside a Manhattan theater hanging around their limousines and chatting with one another, so I think angels must do likewise outside a home or church where a fellowship of Christians is taking place. What a wonderful God we have, and how wonderful to know the truth that in this sick, dark world that is “…under the control of the evil one” (1 John 5:19) and his demonic henchmen, more than twice as many good angels are on our side. 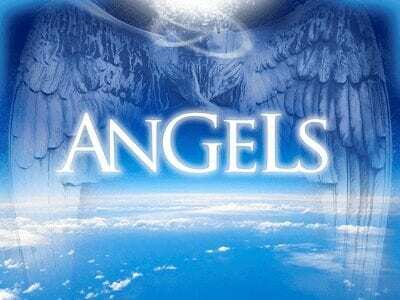 No doubt millions of miraculous, angelic interventions have occurred throughout the history of mankind, with angels looking like all kinds of people, wearing all sorts of clothing, including various uniforms, driving vehicles, and having money or other helpful things with them. One day we will meet them, hear their stories, and be able to thank them for their help.